Pamper Yourself with Spiritual Core Strength! This Saturday, July 19, at 10 a.m.–we will meet for a very special ongoing event called “10-10-10: Strengthening Your Core.” We will be talking about the 10 Core Beliefs of a Christian–10 Core Actions (Practices)–and 10 Core Values. This is a chance for you to get in the best spiritual shape of your life! Afterwards, there is an optional chance to go to lunch at a local restaurant. On Sunday, July 20th we will have worship at 10:15 a.m. Since Linda is away, we will again be having music from Camp Living Waters–sort of a camp sing along! 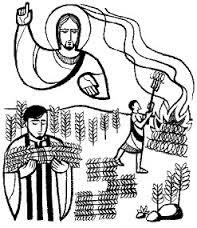 The sermon is based on Matthew 13, the Parable of the Wheat and the Weeds. Blessings to you on these beautiful summer days from the staff and members of Emmanuel Reformed Church UCC.